To make your own traditional puff pastry you need a great deal of time, good math skills, cold hands, and a lot of patience (and butter). For the rest of us, there is a quick puff pastry, or rough puff, as it is better known. There are numerous online resources to tell you more about its history, particularly this post at Chocolate and Zucchini. The goal of perfect puff pastry, traditional or quick, is achieving thin, crisp flaky layers of pastry. This happens when layers of butter are trapped between layers of dough. For traditional puff pastry, you make a dough and then make a giant butter patty that is almost the same size of the dough. You wrap the butter in the dough and then continuously fold and roll the dough to create the many layers. At the same time the dough must be kept cool, so as not to melt the butter. Rough puff cheats by rubbing the butter into the flour and then doing the folds all at once, without resting the dough. You do not get the uniform layers that you would with a traditional recipe, but you still get a wonderfully flaky pastry dough, and you save a lot of hassle. In school we had a straightforward procedure for rough puff: equal parts butter and flour rubbed together, pinch of salt, enough cold water to bring the dough together, and at least three rotations of folding and rolling out. Chill for about an hour, then you're ready. Equal parts butter and flour. Here I use 200 grams of each. Plus a pinch of salt into the flour. 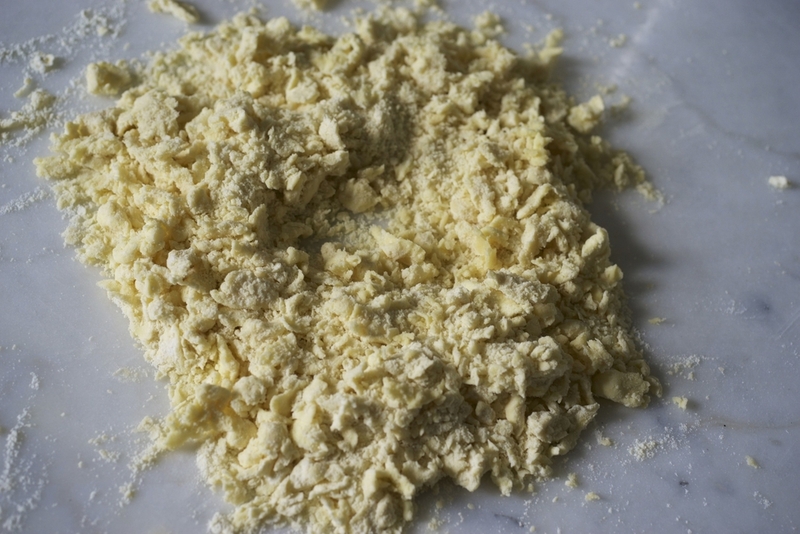 Now, rub the butter into the flour, as if you were making a pie dough. You can use a pastry blender, fork, two knives, or your hands (if they aren't too warm). Now add enough water to form a dough. I know this sounds rather vague, but just add a little at a time until it comes together. If it becomes too sticky, just add a bit more flour when you roll it out. Fold over one third, then fold the rest over top of it. Rotate the dough so it is vertical, then roll that out (the long way) into a rectangle again. Repeat the folding. Keep folding and turning at least three more times, then wrap in plastic and store in the fridge. Cool for at least an hour, then it is ready to use. This recipe makes a little over 450 g, which is perfect for this, and you can use the leftovers for this. Puff pastry will last in the fridge for a few days, and can also be frozen (defrost in fridge overnight).